Larch is the wood Yourte.ca uses to manufacture its yurts. Its resistance to rot, its elasticity and its solidity dictated our choice. Larch has a density equivalent to that of the cherry wood. 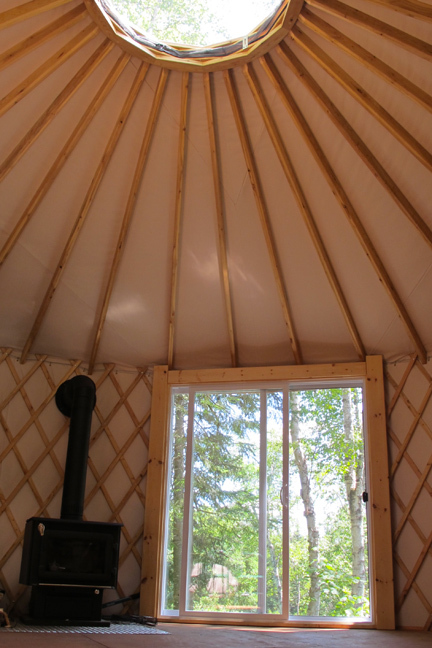 Each pieces of larch used inside the yurt are treated with a natural vegetable oil to enhance the beauty of the wood grain. The pieces of wood used outside are treated with a marine varnish containing a UV rays protection to resist bad weather. We use pieces of engineered products (laminated wood) for the rafters and the pieces of the ring. This provides superior strength and stability. No metal parts are used in the manufacturing of the compression ring. The latter is made of pieces of larch dowelled/assembled with wooden pins and "biscuits". Mortises are made all around the ring to receive the tenons of the rafters. Pins and unexposed metal plates hold together the rafters to the compression ring. 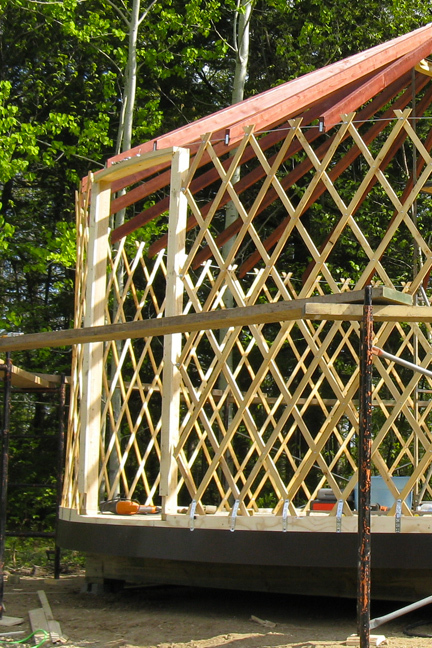 The lattice supporting the roof is built with pieces of wood 11 X 29 mm (7/16 X 1 7/16 in) thick. These pieces are assembled with aluminum and steel rivets. The standard height of the wall is 87 inches. Our company distinguishes itself (its product) by attaching the wall lattice to the doorjamb of the door lintel providing additional strength. Adding a lintel increases the rigidity of the structure while allowing an efficient door installation. 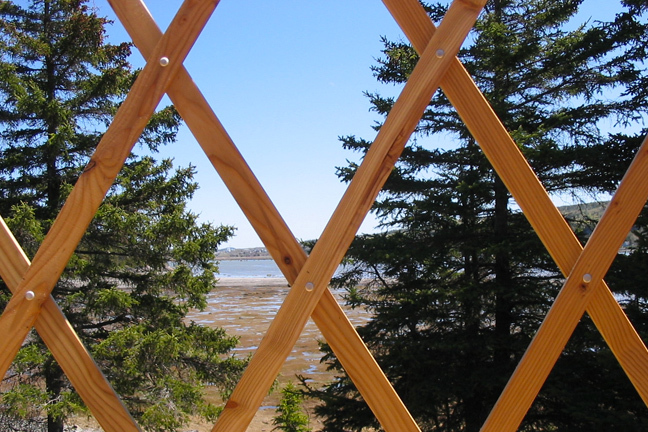 A galvanized steel cable with a breaking strength equal to 1900 or 2700 kg – 4200 or 6000 pounds (depending in the size of the yurt) is used to hold in place the entire framework. 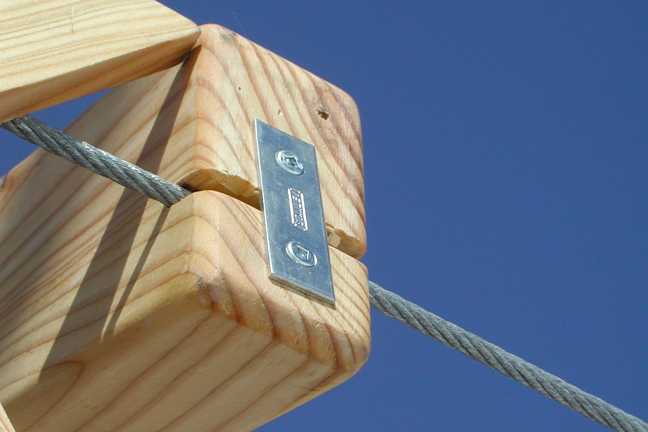 Once the assembly of the yurt is finished, the hardware that attaches the cable is dissimulated in the frame of the door. 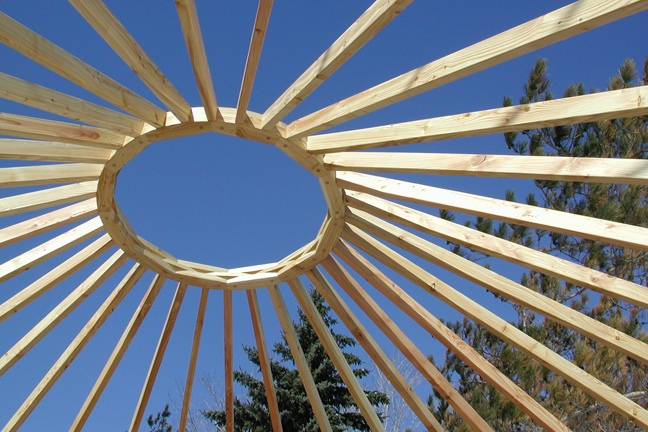 When the yurt is installed in an area where snowfalls are significant and/or is exposed to strong winds, we install rafter studs. 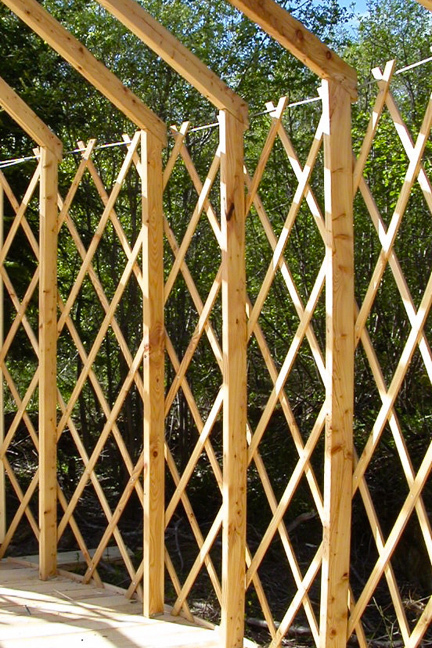 These studs are included for the yurts of 24 and 30 feet in diameter. They are used, among others, to support kitchen cabinets, a murphy bed or a mezzanine. 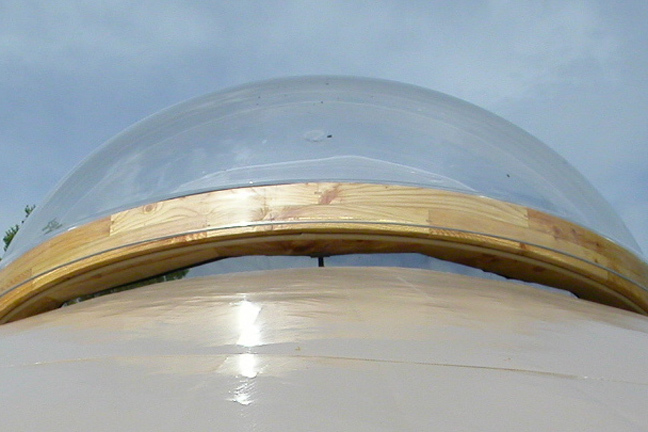 The dome is 52 inches in diameter and is mechanically fixed to the external wood ring. Thus fixed, it does not react to the movement of the framework, therefore ensuring perfect waterproofing. The dome covers the entire wood ring, always in the aim of minimizing the maintenance work. The external wood ring is built the same way as the compression ring. An exclusive system to collect water, produced by condensation, is installed on each one of our domes.An opening and closing system is also installed. Stopping devices allow precise control of the system when opening or closing the dome. 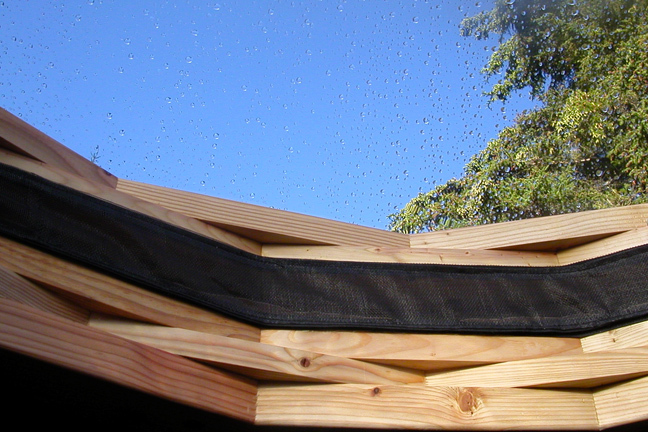 A mosquito net located between the exterior and interior wood rings is unfolded automatically during the opening of the dome. 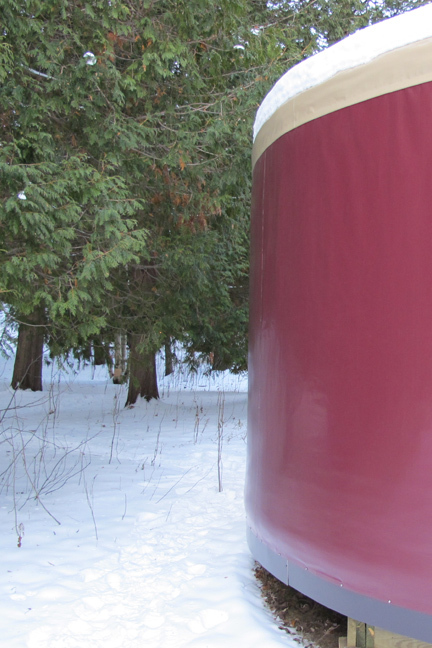 This system developed by Yourte.ca allows the aeration of the yurt without interference in the observation of the sky while preventing flies and other flying insects to penetrate in the yurt. The choice and arrangement of colors for the walls and roof will allow you to customize your new dwelling. A wide variety of colors is available. The outer fabrics are treated to resist UV rays and fire. The weather side has a shiny finish to prevent dirt from sticking to the fabric. These fabrics are guaranteed 8 years by the manufacturer and offer a very strong resistance against tearing. Yourte.ca guarantees his fabrics for a 12 years period. To prolong the life of the fabrics, they are assembled with a method of high-frequency welding assembly with out sewing. This process makes the fabrics perfectly impervious for the life time of the fabrics. 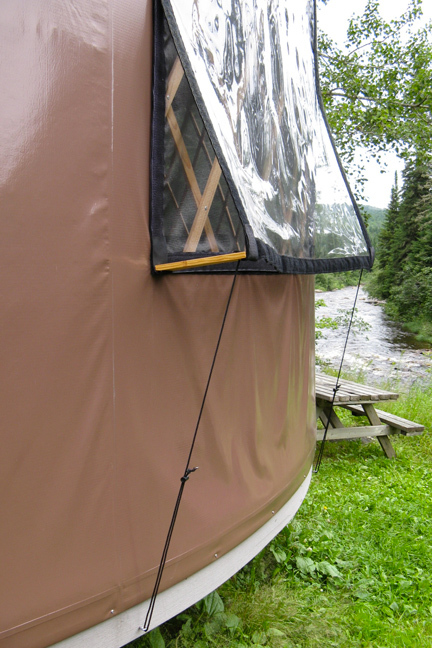 The exterior wall fabric is attached to the perimeter of the floor of the yurt to ensure an airtight seal. Insects and rodents can’t enter the yurt, unless you love their company ... in this case, leave the door open! A gutter can be installed above the door. This device protects the door against the rain. A selection of fabrics is available for interior finishing. These fabrics are non-flammable and resistant to decay. The choice is made depending on the intended use and desired ambiance. 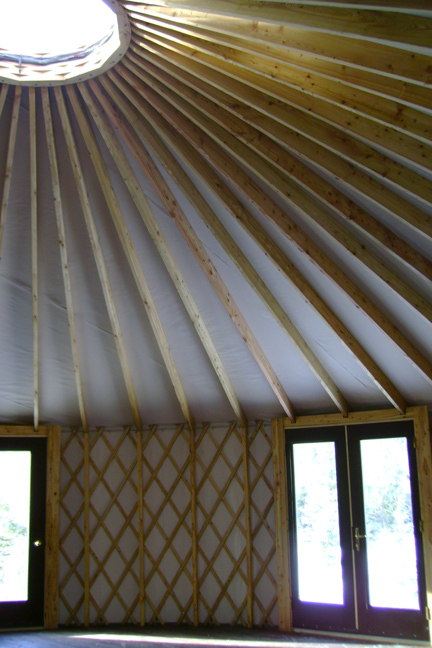 Cotton can be used, it can control the humidity level in the yurt. The use of an insulator composed of air bubbles trapped between a plastic foil and a polyethylene sheet provides comfort for all seasons. Assembly techniques specific to Yourte.ca prevent air infiltration. 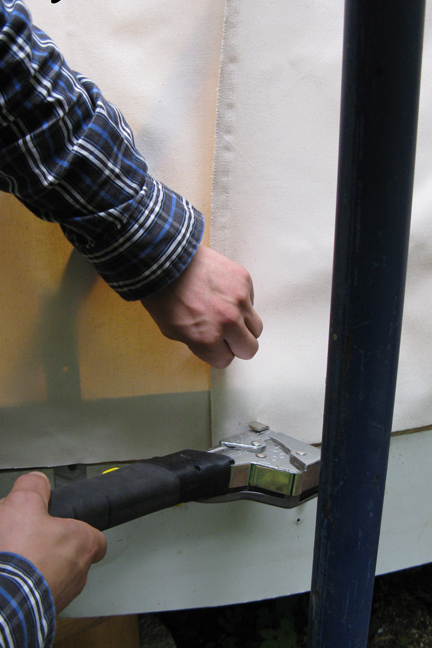 It is possible to use several layers in order to reduce heating costs. The standard height doors are made of steel or fiberglass faux wood. The hardware used for opening and closing is guaranteed for commercial use. It is possible to install one or more doors: single, double (French style double doors or patio). One, or more, thermal window hung with mosquito net can be installed in the door. 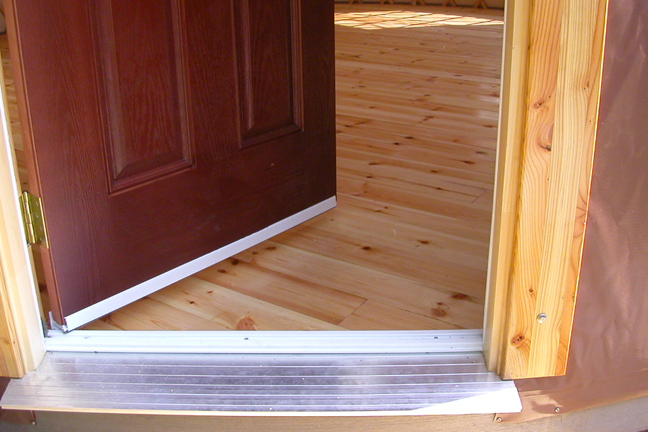 The threshold of the door is made of aluminum. The use of this material is intended to prevent wear of the threshold. We offer two types of windows : Clear vinyl windows are fitted with a mosquito net. The vinyl is treated to protect against UV rays. The Velcro strips are two inches wide, providing maximum protection against rain and wind. We also offer windows of residential and commercial type. Window models available are the same as those proposed in the conventional construction. The manufacturer guarantees the windows. 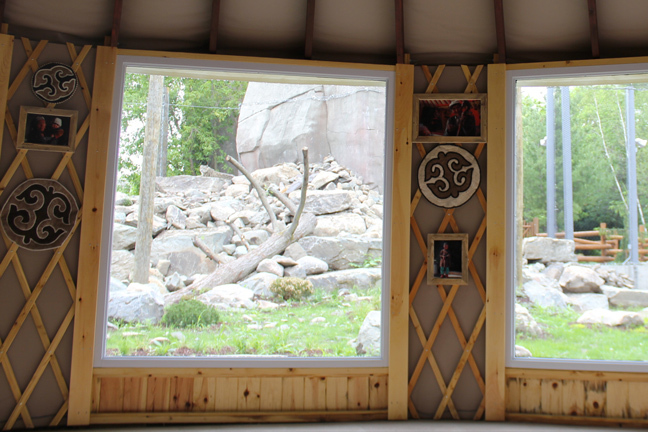 The floor of the yurt can be achieved by decorative concrete or plywood covered with wood, ceramic or flooring. 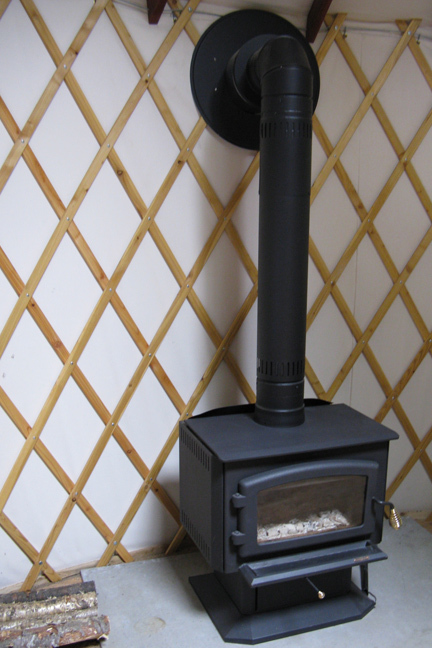 Our company can assist you in choosing the best floor depending on the use of your yurt. 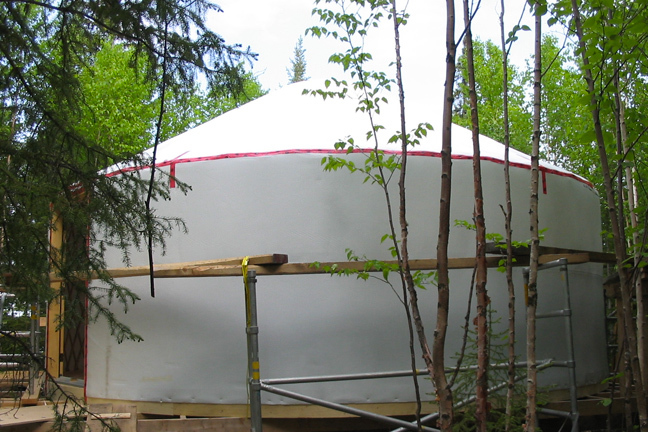 A yurt on stilts with insulated floor is the ideal solution to minimize the impact of construction on both the environment and on your wallet. 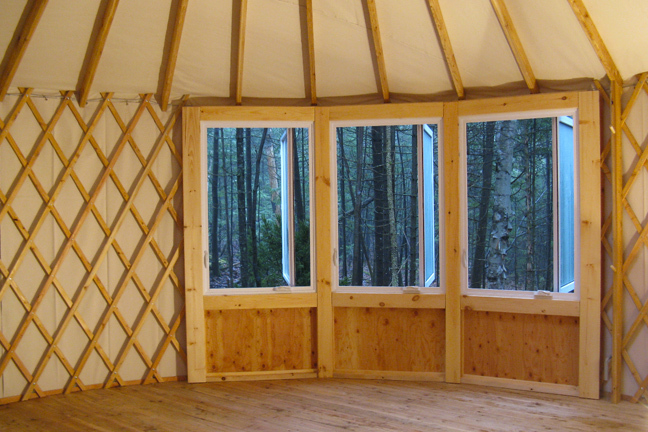 All types of heating used in a conventional housing can be installed in a yurt (wood, electricity, propane, oil, natural gas, etc.). We can provide a base of aluminum or galvanized steel to facilitate the safe installation of a fireplace.